I can’t tell if Disney’s Big Hero 6 beating out Christopher Nolan’s Interstellar at the box office this weekend means one is over performing while the other under performs (they took in $56 million and $50 million respectively, so neither one is exactly a flop), but one thing is for sure, when The Hunger Games: Mockingjay—Part 1 drops later this month, it’s going to be a free for all. Catching Fire, the second film, earned $158 million its first weekend, and the first part of the final chapter is poised to follow suit. To keep the hype train rolling, here’s another new clip. After being rescued from the Hunger Games arena at the end of the last movie, heroine Katniss Everdeen (Jennifer Lawrence, now the biggest female action hero in history), finds herself in District 13. Up to this point, most of the dystopian world of Panem thought this region had been destroyed decades ago, but in reality, it’s been living in secret and is now the seat of the burgeoning revolution sweeping the country. And Katniss is the symbol, the public face of this rebellion. Just in case you forgot, The Hunger Games: Mockingjay—Part 1 is fast approaching. To remind you, earlier today with got a new clip, and because you can never be too aware of big Hollywood blockbuster, they’re back Legendary is back with a new collection of stills from film. In the wake of last year’s Catching Fire, the middle book in Suzanne Collins’ massively best selling trilogy, Mockingjay finds heroine Katniss Everdeen hanging out in District 13, which was previously thought to be destroyed, and where she has become the public face of the rebellion that burns through the dystopian world of Panem. That in and of itself is a lot of pressure for anyone, but when you pile some PTSD, survivor’s guilt, a love triangle, and other things on top of that, she has quite a bit to deal. With Christopher Nolan’s space epic Interstellar hitting a limited number of theaters today, and opening across the rest of the world on Friday, the next big sci-fi movie on the calendar is The Hunger Games: Mockingjay—Part 1. The first part of the final chapter of the popular teen-centric dystopia is ramping up the marketing engine for the final push. They’ve already dropped tons of trailers, TV spots, photos, and all manner of viral videos, and today brings this new clip for you to check out. This 41-second snippet is basically an extended version of a moment you’ve already seen in a recent TV ad. In Mockingjay, after being rescued from the Hunger Games arena, Katniss Everdeen (Jennifer Lawrence) finds herself in District 13, which everyone thought was destroyed. She’s alive, and safe from the forces of President Snow (Donald Sutherland) and the Capital for the time being, but she’s dealing with some stuff, and part of that is survivor’s guilt because she thinks her sometimes boyfriend Peeta Mellark (Josh Hutcherson) is dead. As you learn in this clip, that’s not the case. Philip Seymour Hoffman’s tragic death earlier this year shocked film fans and cinephiles everywhere. A prolific performer up until the very end, the 46-year-old actor had numerous films in various stages of completion. Movies like God’s Pocket and A Most Wanted man have appeared in the interim, but the highest profile project was by far The Hunger Games: Mockingjay—Part 1. 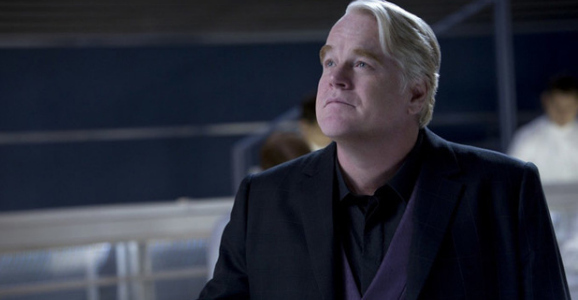 Director Francis Lawrence recently talked about how Hoffman’s death impacted the cast, crew, and production. There’s been plenty of buildup towards The Hunger Games: Mockingjay—Part 1, the beginning of the end of the lucrative dystopian teen franchise, including trailers, photos, posters, multiple viral strategies, and so much more. 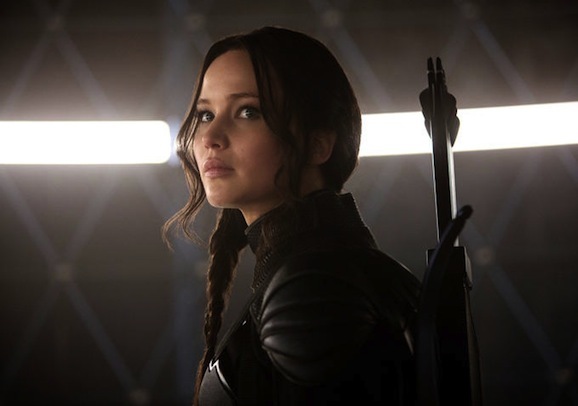 Thus far, the marketing has focused, and rightly so, on heroine Katniss Everdeen (Jennifer Lawrence). This approach makes sense, she’s the center of the franchise, Suzanne Collins’ novels tell the story from her point of view, and Lawrence is one of the biggest movies stars in the world right now. But if you’ve ever sat back and said, “But what about Peeta, bro?” this new TV spot is for you. We’re getting into some potentially spoiler-y territory for those of you who haven’t seen the last film, The Hunger Games: Catching Fire. Considering how much money that movie made, there aren’t that many of you out there, but still, better safe than sorry.